THE COVER-UP TO COVER ALL SEASONS!! In an elegant Avian print, this multi-way design was destined for warm-weather getaways-yet throw it on over a black top and Travel Tights, add heels, and it’s just as at home in city. It has adjustable snaps creating sleeves and a v-neck, plus you can add a Sleeve/Sash to the waist for definition. A beautiful layering piece for traveling, ideal for leisurely locales and luxe lounging. The Butterfly Wrap fits in your beach bag and can be worn as a shawl, skirt, dress, jacket, tunic and more. Dress it up for evenings or wear it to the beach over your bathing suit. Designed to be One Size and easy fitting for all body types. This look is great with the sleeve and sash used as a belt and travel tights worn with the skirt flipped up to create a sleek one piece. See what customers are saying about our collection here. Our Wrinkle-Free Chiffon is the ideal travel fabric made from a high quality easy care wrinkle-free microfibre. Very similar to silk chiffon but much more durable with a lightweight, silky-soft finish. Think of comfy elegance. We love it for it’s quick dry, wrinkle free, and easy care qualities. Washing Instructions: Diane Kroe's goal is to make your life easier by using fabrics that are beautiful yet stress-free. Simply place your garment in a mesh laundry bag and into your washing machine on the delicate cycle in cold water. After washing, hang to dry or tumble-dry on low-delicate (mesh bag recommended). Your pieces will remain as good as new for a long time. Our quality and workmanship are designed to last. All Diane Kroe designs are proudly and ethically made in Toronto Canada. Refunds: At Diane Kroe every garment is made to order, just for you, in our Toronto studio. For this reason purchases are non-refundable as we pay our workers by piece. Happy customers are our main priority and we will make the necessary adjustments to ensure your Diane Kroe design meets your expectations. Exception: We try our best keep our shopping cart current, though sometimes we may unexpectedly sell out of a fabric. We will be happy to send you a full refund if there is no other option to your liking. Cut from luxe wrinkle-free chiffon, the Butterfly Wrap was designed with versatility in mind. It's the perfect compliment when added to a few of our DK basics. Shown here as a kaftan layered over Travel Tights and Convertible Cami. Simply secure the hidden snaps under the arms and in front. The idea came from the struggle to find a super light-weight layering piece that could transition seamlessly between tights, jeans dresses and swimwear. Shown here as a belted blouse using a Sleeve/Sash and Bangle to create a cinched waistline. Secure the hidden snaps under the arms and front then loop Sleeve/Sash through the Bangle and tie in back. A delicate baby hem, hidden snap closures, and a timeless print that lends itself to both tropical and luxury settings, gives this glamorous piece both travel and everyday-wear credibility. Shown here as a glamorous cross front dress layered over Travel Tights (band is pulled up over bust) and cinched waist using a Sleeve/Sash and Bangle. To achieve this look unsnap and wrap the Butterfly crossing the panels over your chest and tie in a knot behind your neck. Loop Sleeve/Sash through the Bangle and tie in back. Meanwhile, the maxi length option as a skirt leaves plenty of room for sheer layering options over both tights and swimwear. Shown here as a sheer wrap skirt layered over Travel Tights (band pulled up over bust) and Sleeve/Sash adding some arm coverage for cooler settings. Simply wrap the Butterfly around waist and tie in back. While we’ve yet to find a look we don't love, our insta-outfit long sleeve version (layer over Sleeve/Sash and Travel Tights) has become a fast favorite for the cooler days. Shown here as a flowy jacket over cozy sleeves and warm tights adding a pop of colour and dimension to basic black. Secure hidden snaps under arms and leave front open. On top of the Convertible Cami the Butterfly is worn like a silk scarf over the high-neck version of this top. Fluid fabric in a stunning print ties this silhouette together. Unsnap and drape around neck. Layered over Travel Tights with or without Sleeves this look is practically seasonless in that it’s perfect for everything from a beach cover-up, garden parties to winter weddings. Wrap Butterfly around bust and snap. 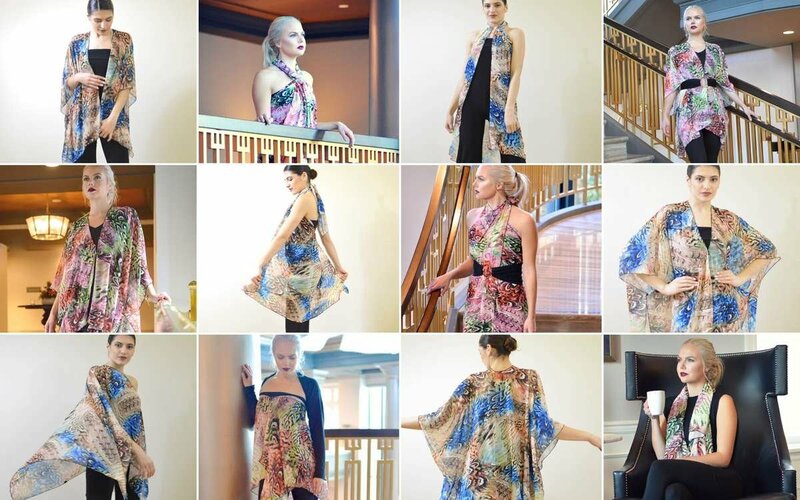 The Butterfly Wrap has been Diane Kroe original design since 2010 offered in limited edition fabrics and prints now updated in a NEW easy-care, wrinkle-free chiffon. For updates, style ideas and special offers join our Exclusive Customer List and follow us on Instagram. Diane Kroe designs for real women of all different body types.